Fèis Ìle Friday was a Bunnahabhain kind of day: sun-filled, relaxed and full of smiles at this most secluded and beautiful of distillery locations. Richard Woodard joined the celebratory throng. If you didn’t have a grin on your face at Bunnahabhain on the Friday of Fèis Ìle, you were clearly a very troubled person. A calm, blue-skied, laid-back day where sunbathing on the grass above the beach was at least as popular as sinking a few drams. Even the sometimes ominous-looking Paps of Jura smiled down on the scene like benevolent and indulgent giants. Even parked at his house some way above the beach, Brown’s car is regularly adorned with salt deposits; the swiftly rusting hoops around the casks in the warehouses need careful monitoring just in case they snap under the impact of constant corrosion. This is a place shaped, hardened and sometimes eroded by the sea; nestled into its little cove for protection but, at the same time, facing proudly and defiantly out over the waves. Or, as on Fèis day, basking in the warmth like a holidaymaker after a long and pleasurable lunch. Not sleeping, though. The chattering crowds laughing and tapping their feet to frequent musical accompaniment from the distillery courtyard were enlarged by the presence of a boatload of daytrippers from Glasgow. Shipped in by Bunnahabhain in the first venture of its kind, these folk paid £95 a ticket for a flavour of Fèis, including tasting, full Scottish on the way out and farewell dram back in Glasgow. More than 70 took the opportunity, and the distillery is already planning a repeat next year. 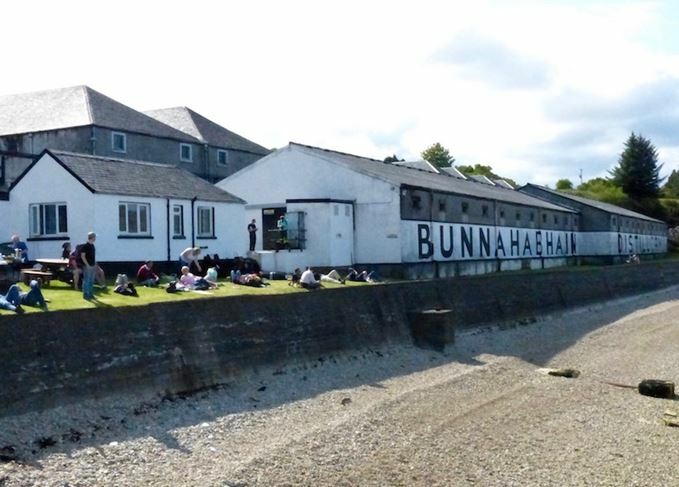 The queues, such as they were, lined up for seafood or pizza, since Bunnahabhain’s two Fèis bottlings had gone on sale four days earlier – adding to the general air of relaxation. No frenetic dashes to the distillery shop or panicking over snagging that bottle here. Those Fèis bottlings offered little twists on Bunna’s classic Sherry cask maturation, epitomised by the core range’s exquisite 18-year-old: one with six years in ex-Amontillado following a decade in whisky refill; the other – named Moine after the Gaelic for peat – an unusual peated Bunna’, 12 years old including three years in a Pedro Ximénez cask. Moine was one of the drams included in the masterclass hosted by Brown and Dr Kirstie McCallum, recently appointed lead blender for Bunnahabhain’s blended Burn Stewart stablemate, Scottish Leader. Hemmed in by casks on all sides in one of the distillery’s beachside warehouses, Dr McCallum reckoned it was more like being in a giant boxing ring than a tasting – a prophecy that all but came true when Brown made a disparaging remark about blends. Cornered – both literally and metaphorically – he wisely backed down. Dr McCallum then offered a masterclass in chill-filtration – or rather refraining from chill-filtration, as Bunnahabhain and its sister malts have done for the past six years. As well as 18-year-old and Moine, samples included a gloriously scented 14-year-old whisky refill finished in ex-Le Panto Brandy de Jerez casks for four years – full of dark honey and walnut oil, and with a delicious lift of orange zest at the finish. There was also an almost cloyingly sweet PX finish and, alongside Moine, Bunnahabhain’s Ceobanach peated variant – its name variously mangled into ‘ciabatta’ and – most entertainingly – ‘Chewbacca’ – by audience members. As the masterclass finished, the shuttle buses gradually reduced the numbers lolling on the grass or strolling on the pier, and the narrow path that snakes around the headland east of the bay was deserted. Beyond the polite slap of water on seaweeded rock, the distant, diminishing hubbub from the distillery was punctuated by the lazy hum of a passing bee and the baritone chug of a solitary boat headed towards Port Askaig. A day when the only cares in life were the negotiation of the narrow road climbing away from the distillery, and the risk of sunburn. One of the good days.